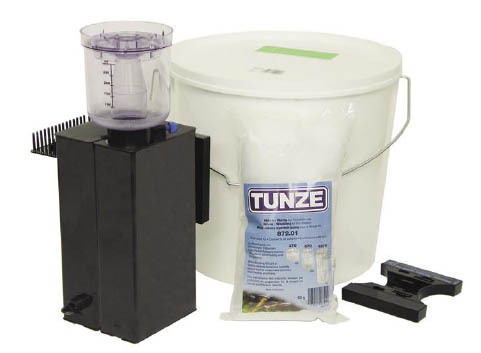 TUNZE® Nano Reefpack 200 offers a new water treatment concept for small reef aquariums from 10 to 52 gallons. The Nano Reefpack 200 consists of a Nano DOC Skimmer 9002, a mechanical Nano Cleaner with a pump (800l/h/211USgal./h) and a magnet holder. The Nano Reefpack by Tunze is designed for beginners as well as for experienced aquarists. The water is treated on the basis of dirt removal and contains no biological stages. Like all TUNZE® components, the Nano Reefpack is a modular solution, which can be supplemented with Osmolator 3155 and Calcium Dispenser, et cetera. SKIMMING ACTION: Nano DOC Skimmer 9002. STORAGE TANK 5002.10: with a volume of 13 litres (3.4USgal. ); is used to hold the refill water. point in the aquarium (up to a glass thickness of 12mm (.47in.). POWER CONSUMPTION: Only 20 W for all components, 230V/50Hz (115V/60Hz). Completely ready for mounting with holding device, storage tank and filter wadding. Dimensions of the skimmer cup: L120 x W114 x H338mm (L4.7 x W4.4 x H13.3in. ).